For some time now, Poptropica has had a problem. A good problem, but a problem nonetheless. The problem: too many Islands! Vampire's Curse Island will be our 25th Island, if you can believe it. And our map was starting to look really cluttered. First, we thought we would just have to erase some Islands. Flush 'em right down the drain. But as our fingers were hovering over the "delete" button, somebody had an idea: why not make a new map? We all agreed that was a much better solution. Now, when you log onto Poptropica for the first time, or return to your blimp from Main Street of any Island, you'll see this new and improved map screen! It has a few advantages over the old one. The Island icons no longer move, so it's easier to read their names. The newest Islands are at the very beginning, so you'll won't have far to look for the latest and greatest adventure. And we've split up the map into different pages, which makes it easier for you to sort through them. Oh, and most important of all: the birds chase your blimp. 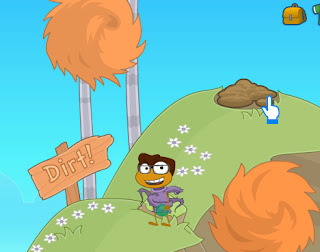 We hope you enjoy the new map, and that it helps makes your visit to Poptropica even more fun than before. Happy Leap Day! There won't be another one for 4 years. The rumors are true: Vampire's Curse Island will be available this Thursday, March 1. 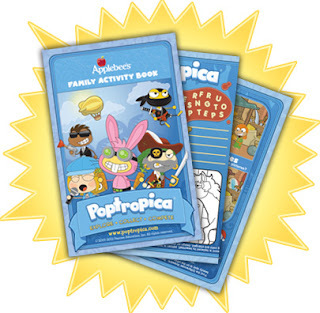 Poptropica Members can play the full adventure; non-Members can play a limited demo. Visit the Poptropica homepage to keep an eye on the official Vampire's Curse countdown. And get ready for an adventure with a little bite! The Poptropica Family Activity Book will be available at Applebee's locations in North America from today until May 7. Bon appetit! Vampire's Curse Island is coming soon, and the fun has already started for Poptropica Members! The Vampire's Curse Island gear pack is available now in the Poptropica Store! If you're not a Member, find out how to get Membership. And fangs for playing! 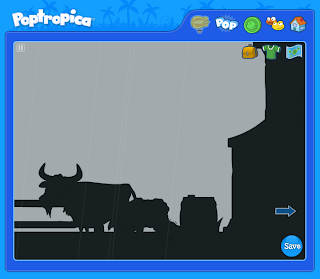 Thanks to a few new features on Poptropica, it turns out that you can play S.O.S. Island in a whole new way, if you just follow a couple of easy steps. First, play through the bonus quest. When you do, you'll get a deep-sea diving suit that lets you stay underwater for much longer than usual. Next, restart the Island while you're still wearing the diving suit. Now, when you start playing the primary quest again, you'll have way more oxygen, and can spend more time exploring the depths! You can even play a little ditty on the piano, as in the picture above. There's always more to explore on Poptropica, so get out there and dive deep! We're always working on new features for Poptropica. Here's a sneak peek at one new project we've got going on. What could it be? We'll have more details for you -- oh, let's call it soonish. If you've been thirsting for more news about the next Poptropica Island, then you're in luck. The Vampire's Curse Island info page is up and running. Get the first details about the Island's story, some of the character's you'll meet, and some bonuses for Members. As always, we'll have more news about Vampire's Curse Island right here as it becomes available. Stay tuned! Visit the App Store or Android Marketplace to download the update, then launch the app. The guides for S.O.S. Island and Ghost Story Island will now be in the list of Island guides for in-app purchase. 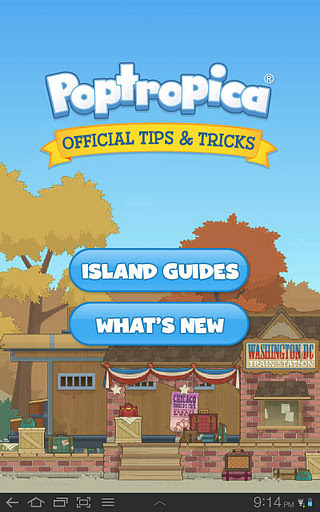 Download the iOS version of the Poptropica Tips & Tricks app from the App Store. Download the Android version of the Poptropica Tips & Tricks app from the Android Market. The trailer for Vampire's Curse Island is here! Vampire's Curse Island is coming soon to Poptropica. We'll have a lot more information soon! While you're diving deep into the adventure, we'll also be sharing a lot more details about Vampire's Curse Island soon. It's a great time to be a Poptropican! Valentine's Day is next week, and we're sharing the love by featuring some classic items in the Poptropica Store. The Big Hearted costume is the perfect way to show you care. If your sweetheart needs a little convincing, the Love Potion will hit the spot. Happy Valentine's Day from Poptropica! 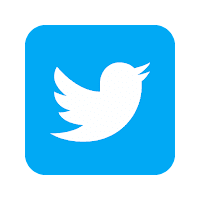 Of course, we'll have all the latest news about Vampire's Curse Island right here, so keep checking back for more about the story, release date, and more. When planning our next adventure, you could say that we had a flash of inspiration. We'll be announcing the next Poptropica Island very soon. This quest will leave you thunderstruck! Because you can take your gear to any Island on Poptropica, you won't find these items in your S.O.S. Island inventory. Instead, use the drop down menu to access your "store items." Your S.O.S. gear will be there, at the end of the line. In honor of the big game this weekend, we've moved one of our classic costumes to the front of the Poptropica Store. No matter who wins on Sunday, your outfit will be championship caliber when you don these duds! The American Football Player costume can be costumized in your choice of four colors.Why would you want a blue helmet, though? Silver is MUCH better!